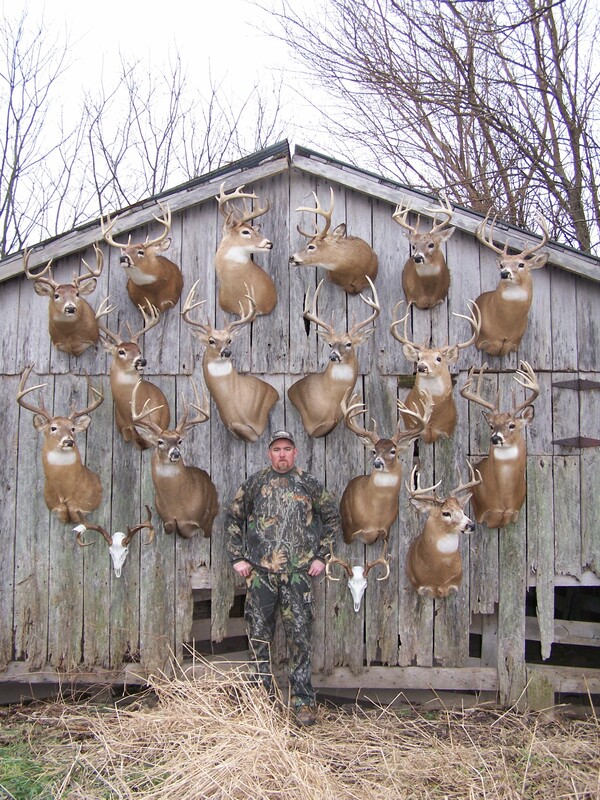 'The Shed Buck' & His Sheds. It’ll go down as one of the more memorable hunts in my hunting career, and certainly one of my most coveted accomplishments. 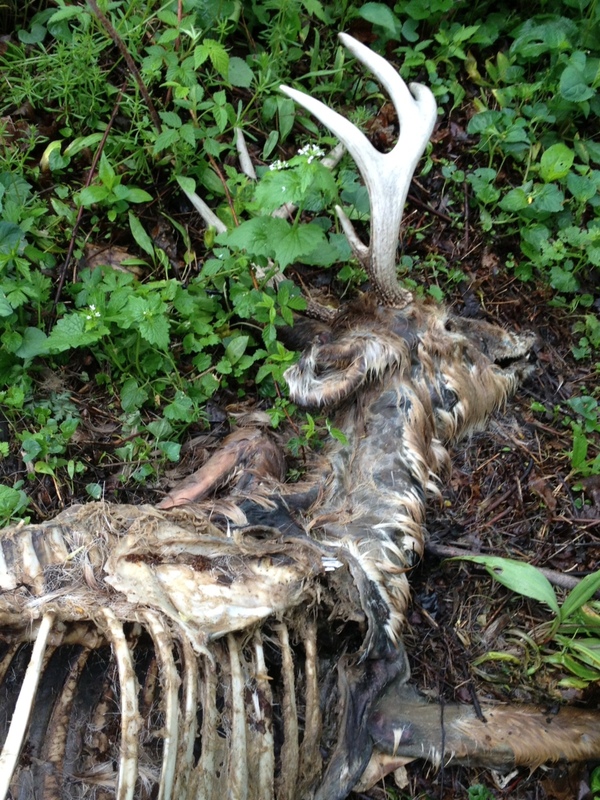 ‘The Shed Buck,’ roams no more. He now rests in peace on my wall! 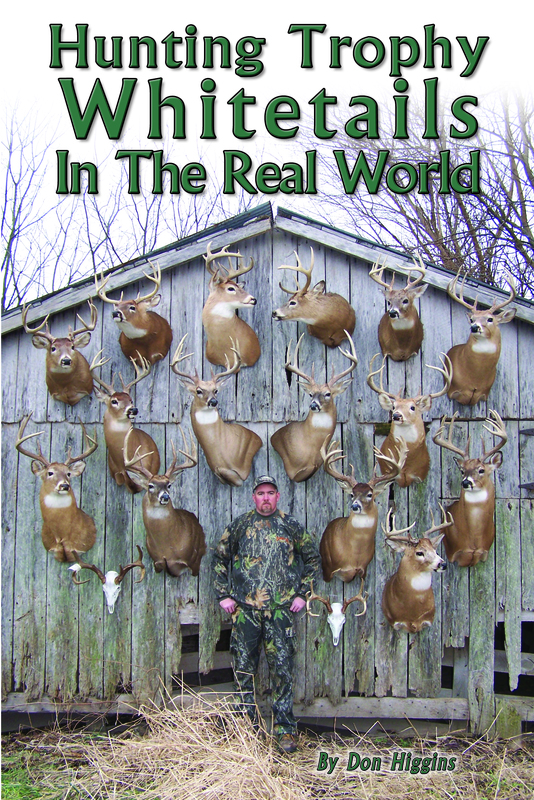 This, like many other hunting stories, started with a single trail camera photo. 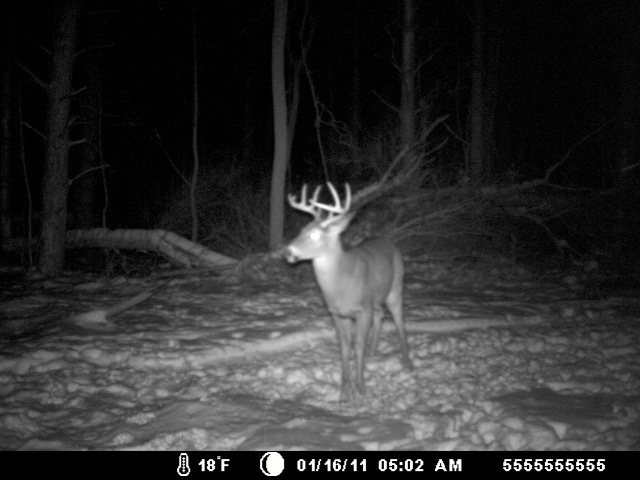 At the end of the 2010 hunting season, I placed my cameras back out into the field to take inventory of what deer had survived the New York hunting season(s). I was pleasantly surprised when a 2.5-year-old 9-pointer made a cameo in front of my Moultrie. I knew who this deer was and, in fact, had watched him all through the summer months in a bachelor group with several other bucks. The odd part was that I’d never encountered him through the entire 2010 season and, to be honest, had forgotten about him by season’s end. Never the less, he was alive and that was a good thing. I closely monitored the one camera the buck seemed to frequent most. The plan was to try and capture as many photos of the deer as possible [I captured dozens] and, if at all possible, recover both of his sheds. It worked perfectly as on Feb. 6th the deer arrived sporting only the left side of his rack. That meant the right side wouldn’t be far from the camera location. Even better, I captured another photo shortly after which showed the buck had dropped his left side, too. 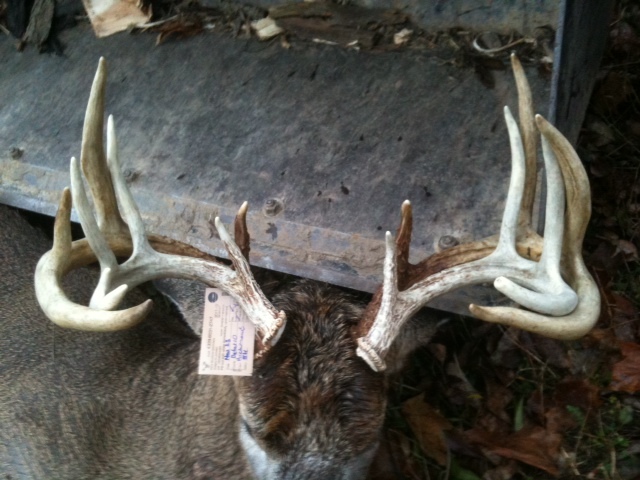 I was very confident I would recover both of his sheds and begin building a history with this deer. The buck appears with his left antler only. I made several attempts at recovering the antlers, but the deep snow made it a difficult task – especially with my then 3-year-old son firmly placed on my shoulders. My luck changed as the snow began to melt in late March. I was able to recover both sheds approximately 20-yards apart. I was thrilled. I had a similar experience with the deer in early November as he chased a doe in from behind me but, as I reached for my bow, he caught movement and walked off in the opposite direction. I was sick. 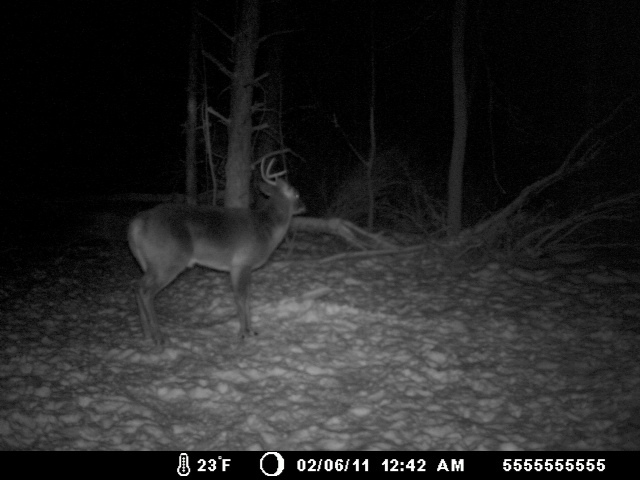 I noticed that night, though, that the buck had a fairly significant injury to his right leg. He walked – or hobbled – very slowly. I hung several new stands in the following days hoping to get a crack at this big 8-pointer with archery tackle. 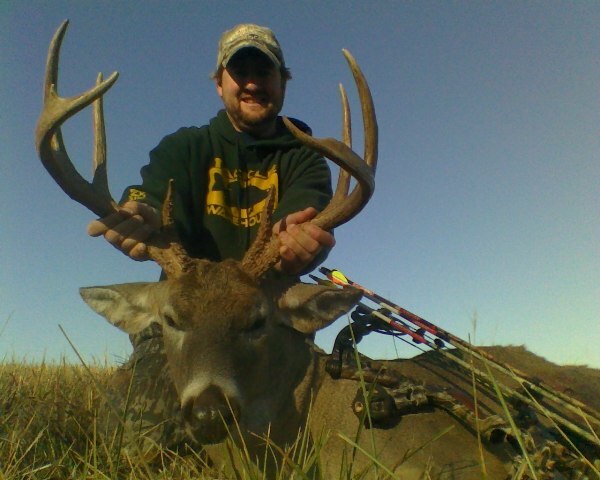 Things changed on Nov. 18th when I harvested another one of my Hit List deer. This meant I’d have to wait until shotgun season to try and kill the big 8. In New York, hunters are allotted one antlered deer for archery season and then another antlered deer for the firearms season. The first opportunity I had to hunt the area was on the afternoon of Nov. 23rd. It was unseasonably warm and a touch windy, but I headed out to one of the new stand locations I had recently hung. I climbed the stand only to discover I had forgotten my safety strap in a tree from the previous days hunt. I made the decision to climb down and hunt from the ground. I quickly formulated a ‘Plan B’ and began to maneuver myself about 100 yards to the south where I would have a good view of a natural travel corridor. It was the best I could do, given the circumstances. As I walked down a mowed path on my way to the travel corridor, I glanced to my right and saw my number one Hit List buck appear out of nowhere. There he stood at 100 yards looking at me through the thick goldenrod. 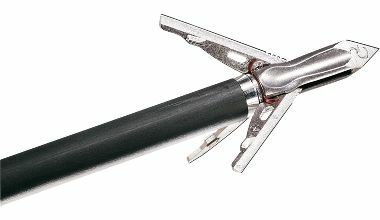 I raised my Remington 1100 .20 ga., centered the cross hairs and let a Winchester fly. 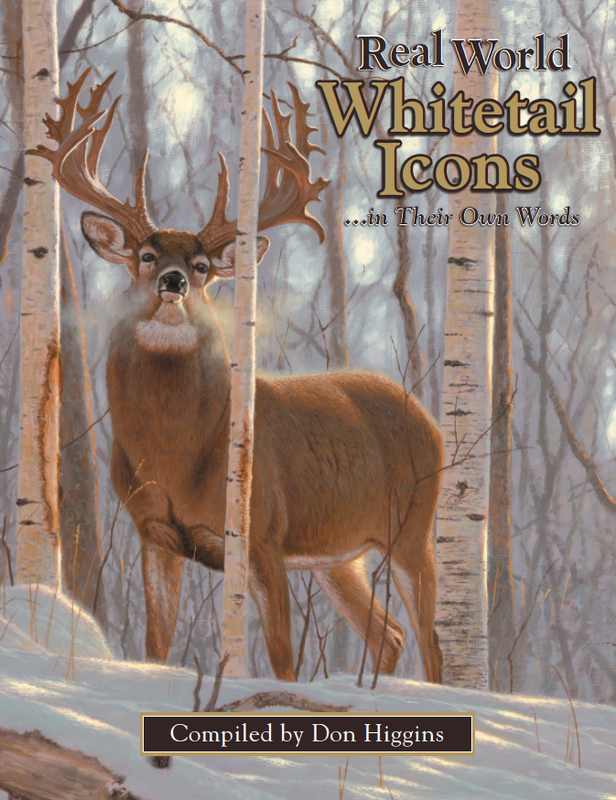 The deer whirled at the sound of the shot and began to move in a northerly direction. 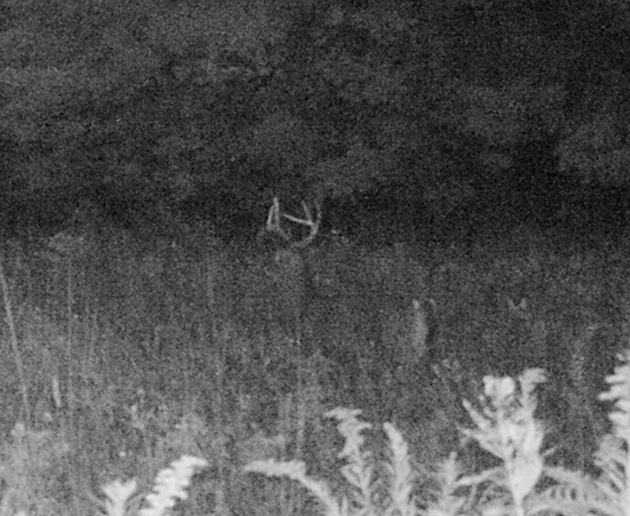 I took off running hoping to get a glimpse and another shot off at the buck, but when I got to where he should have been, I couldn’t find him. I figured one of two things had happened – either I killed him and he was lying dead, or he never exited the goldenrod field because of that bum leg. I slowly climbed onto a nearby dirt mound to get a better view where I saw the buck standing a mere 20 yards from me. Another shot from the 1100 anchored the buck for good. As it turned out, I never hit the deer on the first shot. His injured leg just prevented him from running too far. Only one question remained unanswered now and that was, was this indeed ‘The Shed Buck?’ I went back home to retrieve my 4-year-old hunting buddy, the sheds and the tractor. A quick comparison of the sheds to the deer left no doubt, that I had indeed, just killed ‘The Shed Buck.’ I couldn’t believe it came together the way it did. Looking back, I think this was just one of those hunts that was meant to be. Earlier in the day I had contemplated hunting another property, but decided against it. You take that, coupled with the fact that I forgot my safety belt, and the deer’s injured leg slowed him down enough, which allowed me to get a second shot off. The deer has a 19" spread with 8" G2's. There is no more gratifying feeling for a whitetail hunter than to establish a history with a particular buck and then successfully kill him. It was one heck of a week in the deer woods for me, killing two of my Hit List bucks in six days – one with a bow and one with a gun. Matt Arey has been flipping and pitching lures on the waters of North Carolina for over two decades. He started doing it professionally around the country nine years ago. Arey, 30, is a professional on the FLW Majors Tour where he’s averaged nearly $35,000 in sanctioned earnings each year since 2006. AHuntersTales connected with the Shelby, N.C., native recently to chat about the outdoors as part of an AHT 8. For him, that’s more than just fishing. Like a lot of professional anglers we talk with, hunting is as much of a passion for Arey as fishing. When he’s not fishing, he co-owns a guide service called Rack and Reel Outfitters. 1) Ok, truth be told … do you like fishing or hunting better? Why? My favorite would have to be hunting, hands down. First of all, fishing has been my full time job during the past five years; hunting is a way for me to relax and enjoy God’s creation, while also giving me a break from life on the road. I bow hunt almost exclusively now and enjoy seeing wildlife up close and personal in their natural state. I am amazed at the sights and sounds that a person can witness from a deer stand or duck blind. If I could figure out a way to make a living hunting, I would be happy to make that transition. 2) What gets you excited about the future of the outdoors? Hunting and fishing conservation improvements over the last few years with extremely active groups definitely excite me. For example, groups such as Ducks Unlimited and FishAmerica Foundation are always working hard to enhance duck and fish populations while restoring habitat and improving water quality. Something else that excites me, especially on the fishing side of things, are the new tackle, electronic, and equipment innovations over the last few years. Innovative products such as the Evinrude E-TEC outboard and StructureScan have taken bass fishing to a whole new level. One of the main reasons I run the Evinrude E-TEC is because of its low emissions. I am eager I to see what other amazing products these companies have in store for consumers. 3) What’s your fishing “must have”? How about when you’re hunting? The two things I must have when I am on the water are my Evinrude E-TEC and my Costa Del Mar sunglasses. The success of my career is largely dependent on the reliability of my equipment, and I surround myself with the best products available. Since I love to bow hunt, the number one piece of equipment for me in the woods is my range finder. 4) What is your first memory in the outdoors? One of my very first memories in the outdoors is going on my first deer hunting trip down in Council, N.C. with my dad at the age of 9. 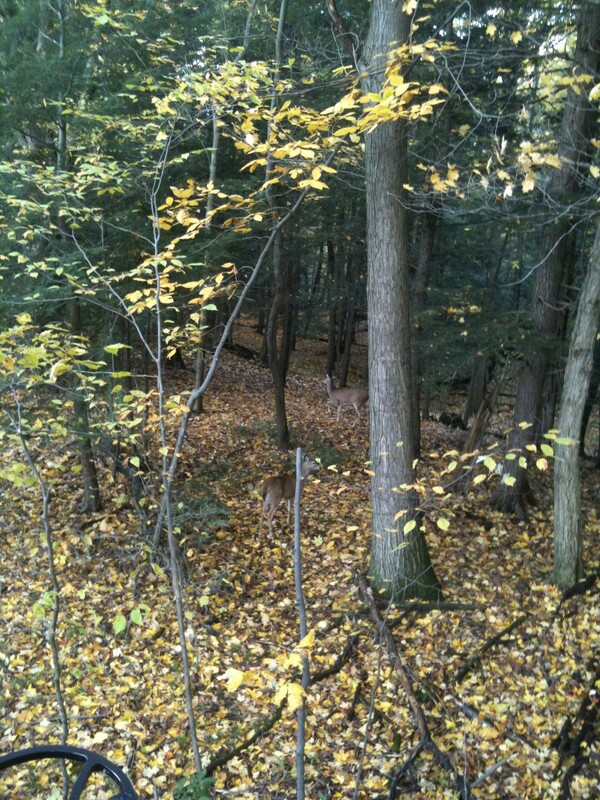 We were deer hunting with dogs, and there was a small doe that was chased out of the brush toward our location. I shot twice with my youth 20 gauge pump that dad had given to me right before the hunt and missed. The club we were hunting with would hold a “trial” for those hunters who were rumored to have missed a deer during the hunt that day. 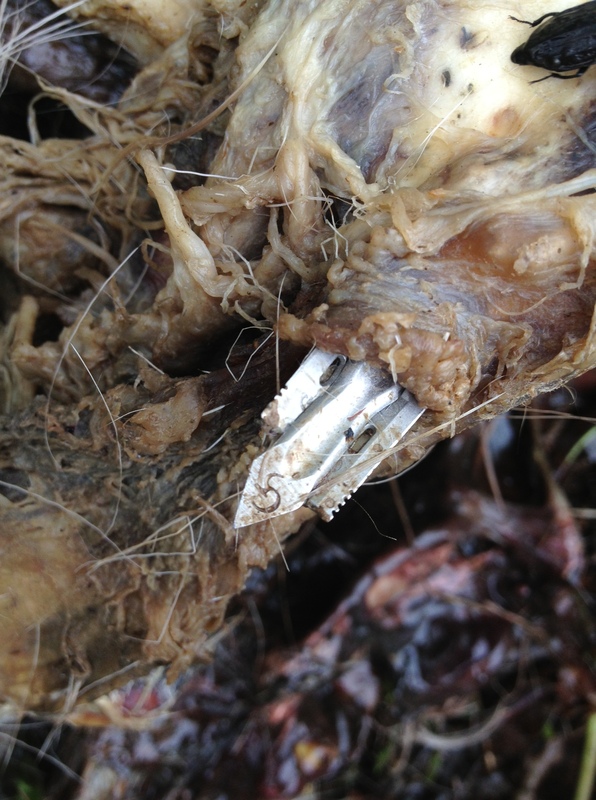 If you were indeed “found guilty” of missing a deer, they would punish you by cutting off a piece of your shirttail and then hanging it on a line that was full of shirttails from over the years (as a joke of course). Well, long story short, part of my shirt became a victim and joined the rest of the bad shots that hung on the line, and as far as I know, it is still hanging there to this day. 5) You guide fishing and hunting too, right? What’s your favorite memory that includes someone else in the lead role with you guiding? This probably involves a young boy and his father on a trip I took to Lake Wylie (near Charlotte) one day. Neither one of them had ever caught a bass over 3 lbs. The very first thing that morning they had doubles on, and both fish ended up surpassing (in weight) their personal records. I have taken quite a few trips with father-son duos and I have never seen as big a grin as the ones that came across their faces when both of those fish came into the boat that day. 6) We hear from people all the time that want to “make a living” in the outdoors. What is your advice to them? My advice would be to take it slow and keep an open mind. If your goal is competitive fishing, don’t bite off more than you can chew. Start out fishing local events to gain experience and see how you stack up and go from there. Whether I am guiding or fishing a Tour event, there is always room to learn more. Always remember that every day in the woods or on the water is a learning experience no matter how knowledgeable you think you are. 7) Every pro angler has a morning launch story that involves getting to a spot they wanted. Tell us your favorite! At the FLW Tour event on Beaver Lake, my wife surprised me for my 30th birthday, by flying to Arkansas and showing up to weigh-in. To top off the surprise, I was fortunate to have a good two days of fishing and make the top 20 cut. After day 3, I was sitting in third place and eager to start the final day of fishing. I arrived to my first spot, went to get a couple of jerk bait rods out of my rod box and panic immediately set in. It was locked! I keep my truck and compartment keys on the same key ring, so normally my truck keys are always in the boat. My wife helped me launch the boat that morning and took my truck with her so she would not be without a vehicle at the tournament. She was headed to Rogers for the day and I knew I could not call her. I debated on what to do and was hesitant to pry open the box, for fear of damaging my boat. After weighing my options and thinking about the opportunity to win $125,000, my mind was made up. Using a flat-head screwdriver and a lot of elbow grease, I was able to break the box open, while ripping through the gel coat and throwing fiberglass everywhere. It was instant relief to finally pull a rod out, but I was angry at myself for such a bone head move on such an important day. 8) Do you need an AHT deal for your boat? How about your truck? As most pro anglers would tell you, sponsorship opportunities are few and far between, and my ears are always open. This doesn’t mean I have to put a picture of Kurt’s Tail on my truck or boat does it? … Oh wait, this is T-a-l-e-s, not Tails! It was great to talk to you Kurt, Happy Hunting! Now it is off to Kentucky for me to chase some Christian County whitetails. Thanks for the time, Matt. 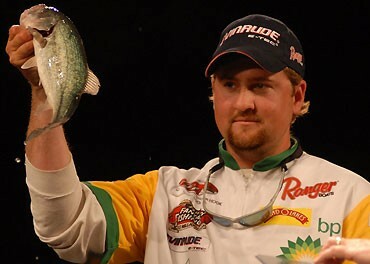 We look forward to seeing how you’re doing on the FLW Tour for many years to come. And keep us posted on your success in the woods. You’re welcome to share stories for the AHT readers anytime! With my roots running deep through the rolling hills of Western New York, I always pay attention when I hear about big bucks killed in that area. Those that have a great story or stand taller than most are often chronicled right here for my readers. But I’m sharing the next one for a couple reasons. 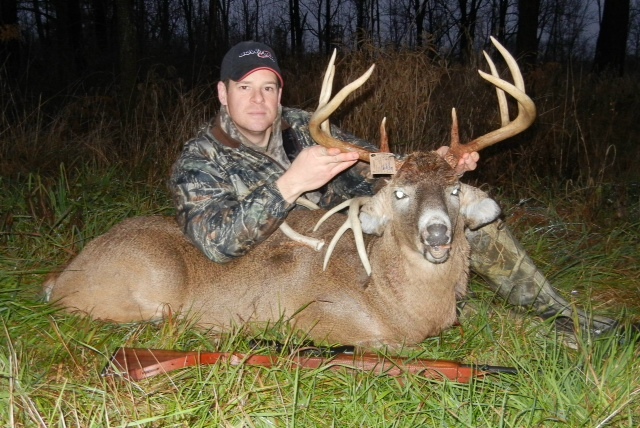 First, the beautiful buck killed by Jake Maurer, of Bergen, is very impressive. 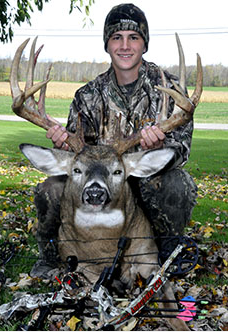 The 17-pointer by a 17-year old is one that will surely go down in the annals of Western New York history as an elite deer – not only in the 2011 season, but of all time. But I’m also sharing it because of the way The Batavian editor Howard Owens handled a couple posts that were critical to his online community news site for posting a picture of “a murdered animal.” Simply put, well done Mr. Owens! Let’s chat about the deer first. The young Maurer’s dad, Jeff, provided the following to The Batavian about his son’s quest. “My 17-year-old son, Jake Hunter Maurer, took this 17 pointer on opening day of this year’s archery season, Saturday October 15, 2011. He was hunting alone on the evening of the first day of this year’s bow season and though the weather was not ideal, a little windy and cool, this buck meandered through and was the only deer that he saw that afternoon. It presented a 20-yard shot and Jake was able to make it a successful one. He found his arrow and returned home for an hour then went back out with his friend and father to track it. It had only traveled about 80 yards where they found out just how big he really was. 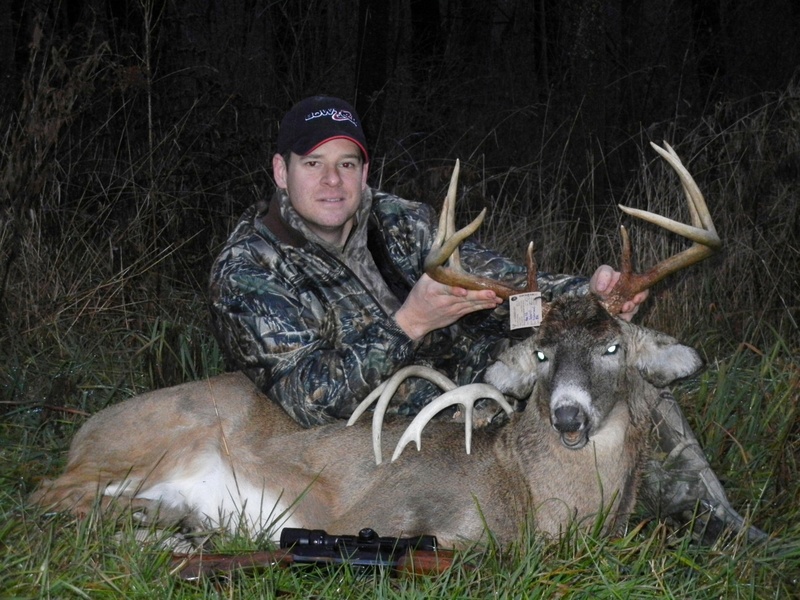 With 17 scoreable points, it may have to be recorded as a non-typical due to the abnormal points on the antlers. But it appears to be big enough for the NYS record book, whether it is recorded as a typical or non-typical. Now onto the second topic. As I scrolled through the feedback (it should be noted that the story was shared by contributing writer Greg Johnston), I was interested to see how the online site would handle the criticism posted in the very first post. In reading Mr. Owens’ reply, I almost stood to applaud! First, I am pleased that he did respond to the feedback. Not every editor, online or not, would choose to respond to the unfortunate response by a reader with zero open mind. I opted to post the entire response, as I thought it was both well written and provided in great detail why the reader could expect more photos of dead deer in the future on The Batavian. “Two years ago, we published a photo of somebody’s trophy, and there was a complaint. Last year, we published a photo of somebody’s trophy, and somebody complained. This year, we publish a photo, and get complaints. And next year, when we publish a similar photo, we’ll probably get complaints. And the year after that and the year after that and the year after that. This is a hunting county. We will provide coverage of hunting news as it’s available. Most people like it. Part of living in a diverse society is you sometimes get exposed to stuff you don’t like. Not everybody is going to be happy with everything we publish, but once I start trying to please everybody, then everybody is going to complain about how boring The Batavian is. First, no dead deer pictures, then no arrest reports, and then no sports coverage because you covered that team and not this team, and then no political coverage because some people find politics upsetting, and then no city council coverage because they’re just politicians, and then no court coverage because that’s a private matter, and then no new business openings because that just gives people a sense of false hope, and then no barn photos because not everybody likes barns, etc. and etc. and etc. Awesome response, Mr. Owens. Congratulations.